Derek McGee may not have won any races at the 2017 KDM Hire Cookstown 100, but his overall results from the meeting were enough to give him the 2017 KDM Hire Cookstown 100 Man of the Meeting Award. Despite not starting in the 125 race, due to mechanical gremlins, McGee was fighting for wins in each race he contested. In the Supertwins race, he was denied the win by James Cowton on the final lap. Over the hotly contested 600 supersport event, McGee was thwarted by up and coming star Adam McLean, in a race which saw the top three covered by less than half a second. 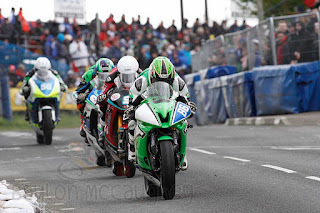 Whilst in the feature race of the day, the KDM Hire Cookstown 100 race, Derek on board his ZX10 Kawasaki ran with eventual winner Derek Sheils, until a slight mistake dropped him back, but still a safe second well clear of third man Michael Sweeney. This award is decided by the points system in each of the Championship races.